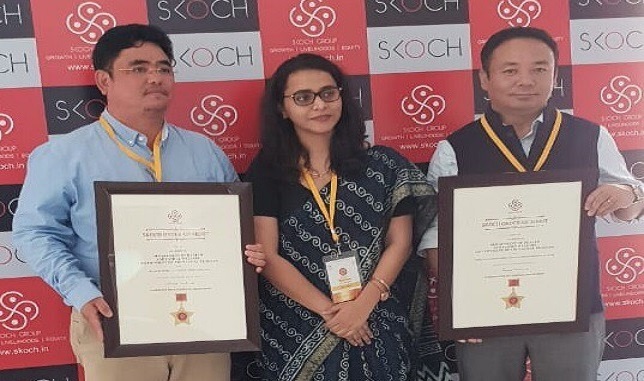 In a proud moment for the state of Arunachal Pradesh, the Measles Rubella Vaccination Campaign and Chief Minister’s Free Cancer Chemotherapy Scheme have bagged the ‘SKOCH-Order-of Merit’ award at the 52nd SKOCH summit held at the Constitution Club of India in New Delhi on Thursday. The award given in recognition of the services provided to the people in the country was received by Special Secretary Health & Family Welfare, Dr Tapasya Raghav, NHM nodal officer, Dr Dimong Padung, and state nodal officer Cancer Control Programme Dr S Tsering on behalf of the health department. Dr Raghav who has been proactive in ensuring full coverage under MRV campaign had initiated adoption of all round measures against any drop outs both in children and pregnant women. Mission mode oriented in approach, the MRV team under Dr Raghav charted a list of preparatory activities wherein the campaign was staged at state level, district level and block level. Chief secretary Satya Gopal and commissioner Health and Family Welfare Kaling Tayeng who reviewed and monitored the project headed series of meetings with the State Steering Committee for Immunization (SSCI) and State Task Force for Immunization (STFI) for the implementation. The duo also ensured District Task Force for Immunization (DTFI) meeting prior to campaign and core group meetings comprising Health, Education and ICDS officers dedicated for regular tracking of activities and for quick action to respond shortcomings during the preparatory as well as during the implementation phase. Considering the vastness of the state bordering Bhutan, China, Myanmar and Assam / Nagaland with limited network of surface communication, the challenge of reaching the corners of the state was a factor for being conferred the award. In view of the MRV campaign which requires logistics for storage with right temperature and timely transportation that reached far flung areas like Taksing in Upper Subansiri, Hawai in Anjaw district, Vijoynagar in Changlang district, the state team was listed top among other states in the country. The state was figured for setting record of vaccinating 4,43,054 beneficiaries out of 4,38,386 target beneficiaries achieving 101.06% vaccination coverage under MRV held during February-March 2018. According to WHO monitoring of the 13,381 children from 9 months to 15 years, 96% of these children were found vaccinated. Meanwhile, the state also bagged award for Chief Minister’s Free Cancer Chemotherapy Scheme. Under the scheme the State Cancer Society of Arunachal Pradesh is in agreement with Tata Memorial Hospital Mumbai for procurement of chemotherapy medicines at high concessional rates which is being provided free of cost to APST cancer patients up to a ceiling of Rs 10 Lakh per patient per annum. The state has registered 3,794 cancer patients in the last 5 years as informed by Dr Tsering. As on date, 407 cancer patients have reaped the benefit from the scheme and 2,427 cycles of chemotherapy have been administered to these patients. The award was conferred for making cost effective provisions for affected families in the state.